I don’t know about you but I am thrilled that we are seeing the beginning of fall weather where I live. I am so ready for sweaters, puffy vests and my favorite boots. I live in those three things all fall and winter! 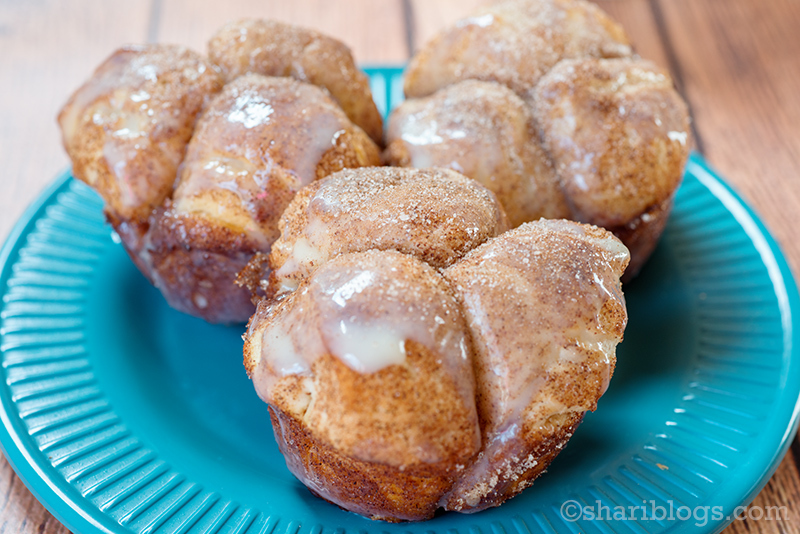 I know Monkey Bread Muffins aren’t a seasonal food but they are full of cinnamon which definitely makes me think of fall. These are a great Saturday morning treat for your family. I made them this morning and this family gobbled them up in no time flat. I would definitely say that makes them a winner!! They would also make a great weeknight dessert. Seriously, you can eat these anytime of day because they are just yummy!! In a small bowl, mix together the white sugar and cinnamon. Set aside. Put a ½ teaspoon of butter in the bottom of each cup of your muffin pan. Cut each of your biscuits into quarters. Next roll up each piece into a ball and roll them in the sugar/cinnamon mixture to coat. Place 3 balls into each muffin cup. Drizzle ½ tsp of butter over each of the muffins. Then with your fingers sprinkle the remaining sugar/cinnamon mixture over the top of the muffins. Put in the oven and bake for 12-15 minutes. Remove when the muffins are golden and bubbly. Drizzle condensed milk over each muffin to your liking. * This should make 10 muffins and one baby muffin. You will only use a small amount of the can of condensed milk. *Recipe adapted from Chef in Training.